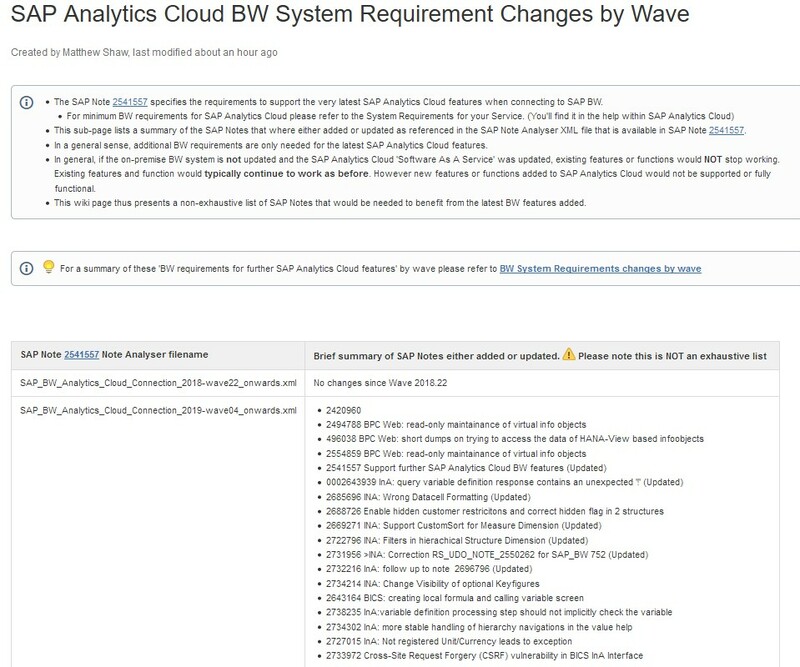 What BW System requirements are needed ahead of SAP Analytics Cloud Updates? How can I know what on-premise SAP BW system requirement changes are needed ahead of time, so all the stories and dashboards etc. in my SAP Analytics Cloud Service continues without issue? This is a common question and frequently asked by organisations that have ‘freeze’ periods. The freeze period this there to ensure continuity at a critical business time such as year-end and means you cannot make system changes including updates to your on-premise SAP BW system. Let’s say your Analytics Service is updated on the ‘quarterly release cycle’ and that quarterly update is going to be made right in the middle of your organisations ‘freeze’ period. You know that each update of your Analytics Service may require additional BW notes to be applied to your on-premise BW system. You’re naturally concerned that you’ll not be able to make those required BW system changes as you’ll be in a freeze period. How can you know ahead of time, which BW system requirements are going to be needed? Is my existing content going to stop working? What BW system changes are needed? There are two release cycles, the bi-weekly and the quarterly release. For those on the quarterly release cycle it means their service is updated just once a quarter, if you like missing the intermediary updates. It means the next quarterly release will receive a considerable number of updates as the culmination of all those intermediary updates made on the bi-weekly release cycle. Today, your Analytics Service is likely to be either already on the first quarterly release of the year or it will be later this month. This will be wave 2019.02. For those on a bi-weekly release you’ll probably already on the next release wave 2019.03 as we don’t perfectly line up the quarterly with the bi-weekly. To find out the wave your service is on, just login and select from the menu ‘System-About’. The second quarterly release of 2019 is currently scheduled to be about wave 2019.08 (subject to change). 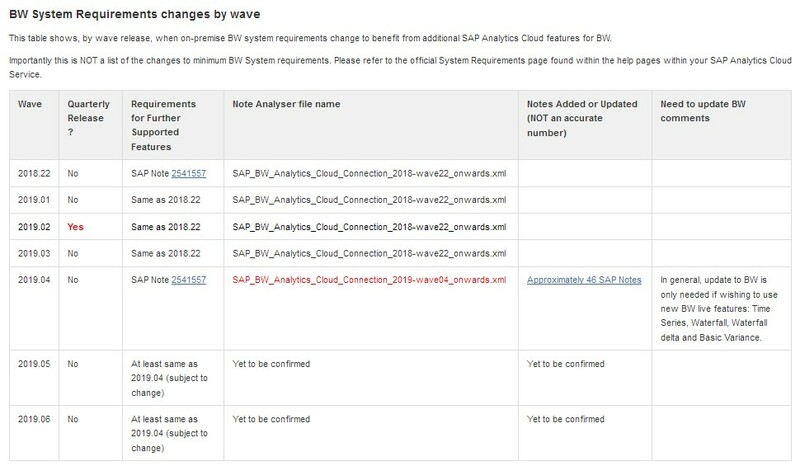 However, the ‘system requirements’ for wave 2019.04 have already been published by SAP. This is great for those on the bi-weekly as they have a few weeks yet to make the necessary changes. But this publication is also very helpful for everyone else on the quarterly release. Since the requirements for that quarterly release are ‘at least’ those of wave 2019.04. This means that BW system owners have months to apply those changes and can know in advance of the Analytics Cloud quarterly update. However, there are likely to be many other system requirements updates made to other intermediary waves, so it should not be assumed these are the only system requirements changes needed. Follow the SAP Note 2541557 for updates. Run the SAP Note Analyser and check which SAP Notes your system may require. Do this every time the note gets updated. Check the name of the SAP Note analyser xml file. Today it’s called “SAP_BW_Analytics_Cloud_Connection_2019-wave04_onwards.xml” and this name gives away which Analytics Cloud service wave it corresponds to! So, it’s a great idea to save it, as once the note is updated you’ll not easily get back the version that corresponds directly to your quarterly release! Follow my SAP Analytics Cloud Support Matrix for updates to a table “BW System Requirements changes by wave” where I track the changes. This is particularly helpful as you can see which wave releases are on the quarterly cycle and since then what new requirements have been added to those ‘intermediary’ bi-weekly updates. Will my existing content stop working if I don’t update? The minimum system requirements are documented in the SAP Analytics Cloud help pages. Login to your SAP Analytics Cloud Service and in the help search ‘system requirements’. These system requirements are the minimum and won’t be changing particularly frequently at all. This is unlike the SAP Note 2541557 which lists system requirement to ‘Support further SAP Analytics Cloud BW features’. What’s the difference? Well the SAP Note 2541557 ‘Support further SAP Analytics Cloud BW features’ is not the minimum requirements, but actually the requirements for additional features and functions that we bring into the service. Our rate of innovation is so great the BW requirements change quite frequently, but these requirements are for new features and functions, not existing ones. It means that if your SAP Analytics Cloud Service is updated and you do NOT update your on-premise BW, existing SAP Analytics Cloud content (Models, Stories, Applications, etc.) would typically continue to work as before. The SAP Note 2541557 is for further features, not existing ones! Should your SAP Analytics Cloud Service be updated but your BW isn’t updated as per SAP Note 2541557, perhaps because you’re in a ‘freeze period’, it just means some of those new BW features may not work entirely well, but existing content would continue to work. It’s impossible to be 100% certain about system requirement changes because those changes will happen in the future, so there’s always needs to be some caution. For those that demand even greater certainty then consider a Preview on your Test Analytics Service. Your Test Edition Service is updated weeks in advance of general availability and it be on the bi-weekly release schedule. The combination of the bi-weekly release cycle and the early access to the next release enables your organisation to validate new features. You can then either update BW or act over problematic content. I hope you found this blog helpful. As always feedback is most welcome.